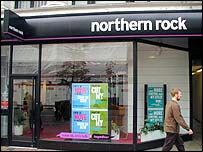 Northern Rock was a minnow in the early 1970s. The loan given to Northern Rock last week was not the first time that the Bank of England has been called on to act as the "lender of last resort". The secondary banking crisis of 1973/74 was the result of a lethal mix of rising inflation (25% at its peak), rising oil prices, a pay and prices freeze, strict credit limits and companies running desperately short of cash. The situation gradually worsened as Edward Heath's Conservative government and his chancellor Anthony Barber struggled to get the economy under control, while at the same time seeking to relax lending curbs through their "competition and credit control" policies. Anyone under the age of 50 will barely remember the day in December 1973, shortly before Christmas when the three day week was announced - and television had to close down no later than 10.30 pm. Although the crisis came to a head then, it was another year before the full effect worked its way through the stock market which fell nearly 60% in 1974. Today's situation in the housing market is very different not least because interest rates and inflation are far lower and there are mechanisms in place to monitor and to support the banking sector if needed: hence the Bank of England's move to help out Northern Rock. In 1973 Northern Rock did not feature in the top 10 building societies (dominated by Halifax, Abbey National and Nationwide) let alone the banks as a whole. In those days the building societies were strictly mutual and operated a cartel which set rates for lending and borrowing. Unlike today they also relied almost exclusively on savings from the public and those who wanted a mortgage had to form an orderly queue. Nonetheless the early 1970s saw a housing boom in which prices doubled in little more than two years. A correspondent to the Financial Times wrote that a house he had bought in 1970 for £20,000 sold for £43,000 in 1972 and that "profits of 100% were widespread". But in 1973 it all began to fall apart as interest rates were ratcheted up. In a little noticed move in April, a month after the budget (where the start of VAT was the big news), the Chancellor announced a special "bridging grant" to the building societies so that the mortgage rate which they had intended to raise from 8.5% to 10% need only go up to 9.5%. With little recourse to the money markets, and a potential funding crisis, societies needed to attract more retail money. The government's answer was a facility of £15 million for three months. It was short term fix, it didn't work and in August the mortgage rate was indeed raised to 10%. Of course, home owners (who then enjoyed mortgage tax relief) were far less indebted in those days and the secondary banking crisis was mainly triggered by the rising cost of financing commercial developments most of which were bought by pension funds. So when the pension funds got cold feet, the lenders (such as Slater Walker, Ansbacher and Keyser Ullman) turned to the big high street banks. As with Northern Rock today, they were unwilling to make fresh advances, and indeed rumours were even swirling around Natwest at the time. Faced with a property meltdown, the Bank of England launched "the lifeboat". The domino effect was averted and the liabilities of the secondary banks were gradually unwound. Maybe someone in the Bank is busy dusting off those files just in case. Certainly Christmas in 1973 was a muted affair. A city broker recalled that employees were asked whether they would prefer a partnership or a turkey for Christmas.